I hope you all got that shiny new DSi by now! I know I did. And it's wicked awesome. But enough gloating from me, and let's head for more limited DSi edition shall we? More specifically, the Japan-only Gyakuten Kenji Premium Edition box. Yup, another Japanese exclusive. Whoopdeedoo. But hey, at least we can look at the pretty pictures, yes? 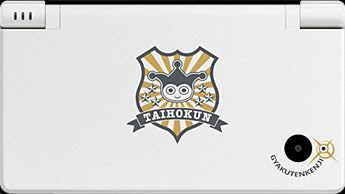 This beauty will cost about $240 and includes the white DSi plus the mandatory Blu Badger and the much-awaited Gyakuten Kenji game.